Feeling a serious case of the Monday’s after this holiday break. I will say I succeeded in disconnecting and of course, indulging in way too many holiday goodies. But, it’s back to the grind right?! This look is all about this little clutch. The superhero graphic is an instant conversion starter. If you could have any superpower, what would it be?! I am still figuring out my answer. Hope everyone had a very safe and fun holiday break. Natali - Great sneakers and clutch! Kiara King - You’ve inspired me to fish out my sunglasses that are very similar to these ones! So chic! 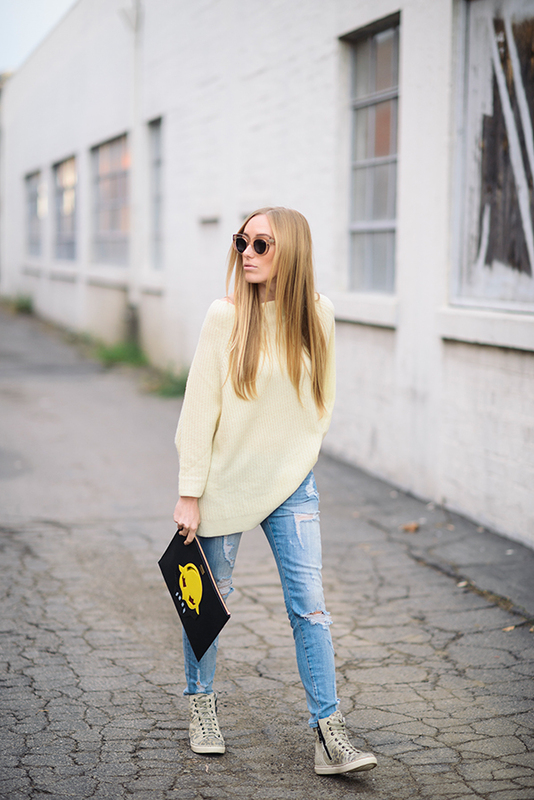 Chrissabella - Love this relaxed look and your clutch is so cool! Sasha - What a cool clutch! Ari - Love the clutch! Jeanne - Very cool sneakers! Liz Lizo - So cozy! Loving the Givenchy pouch! nikki - ahh, i love those jeans! Fashion Snag - Great sweater! Miss Pippi - Lovely sunglasses! Coffeeslag - Loving the shoes!! I’ve been incorporating a lot of sneakers into my wardrobe lately. Shae - Great look! I love these sunglasses.